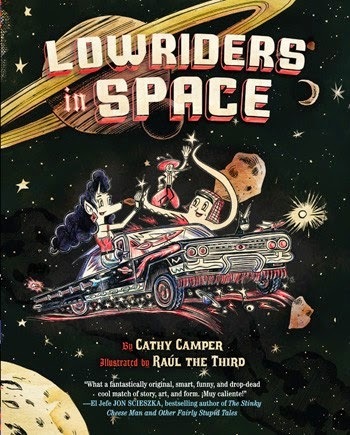 In 2014 I reviewed the stand out graphic novel Lowriders in Space written by author, artist and librarian Cathy Camper and illustrated by Raúl the Third. 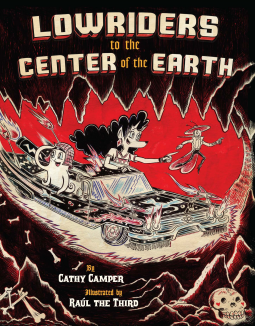 I didn't think it was possible, but I love the follow up, Lowriders to the Center of the Earth, even more than the first book! While the ingenuity of the characters, the cars, and of course, space travel were big draws in the first book, the second book manages to pack in even more fantastic features that I know the students in my school will love. 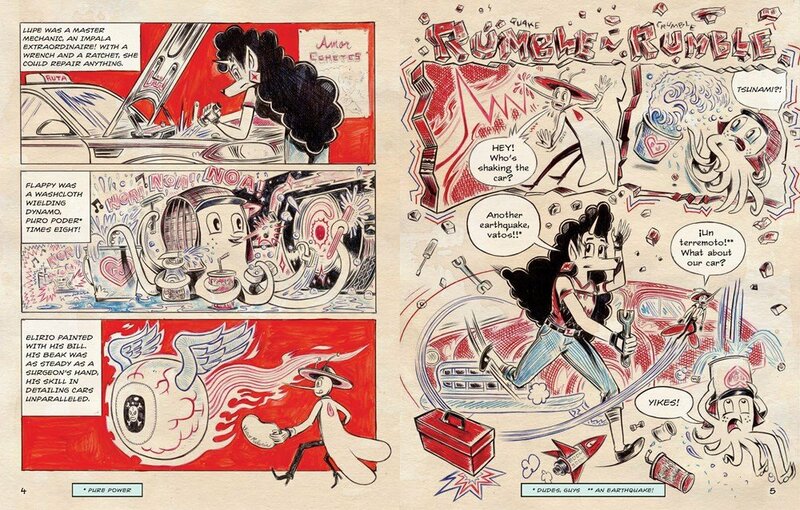 Camper ups the usage of Spanish vocabulary in Lowriders to the Center of the Earth, including a coyote who puns in Spanish, and weaves characters and themes from Atzec mythology and Mexican folklore into this fast paced, action packed graphic novel with even more of the intensely detailed, superb illustrations by Raúl the Third. 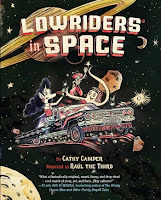 Lowriders to the Center of the Earth starts with Lupe, a master mechanic and "an impala extraordinaire," Flappy, an octopus who wears a deer stalker and often travels in a jumbo popcorn bucket, and Elirio, painter of cars who has a "beak that was as steady as a surgeon's hand, his skill in detailing cars unparalleled, heading out to find Genie, their beloved missing cat. Footprints lead them out of town and into a giant cornfield where their odyssey beings. It seems that Mictlantecuhtli, which I know is pronounced mick-lan-te-COOT-lee, thanks to the "What Does it Mean / ¿Que Significa?" 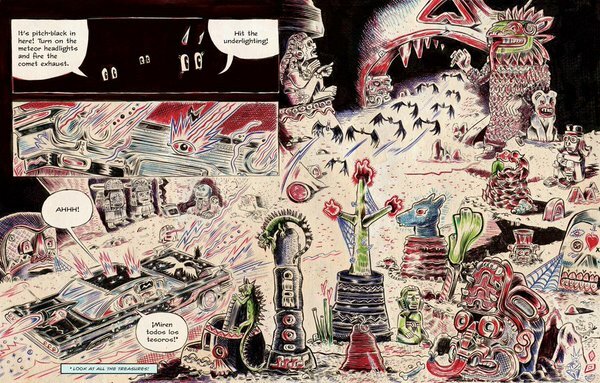 back matter which also includes definitions of the geological terms used in the text, (but do know that these translations also appear in the story itself, at the bottom of the page) has taken Genie to his raucous underworld lair, which can be reached by way of a volcano. Straightaway, they hear a crying, wailing sound and discover a beautiful, blue weeping cat woman looking for her babies. La Lllorona takes a liking to Flappy and, while her crying can be a bit much, she does prove good to have along for the ride. 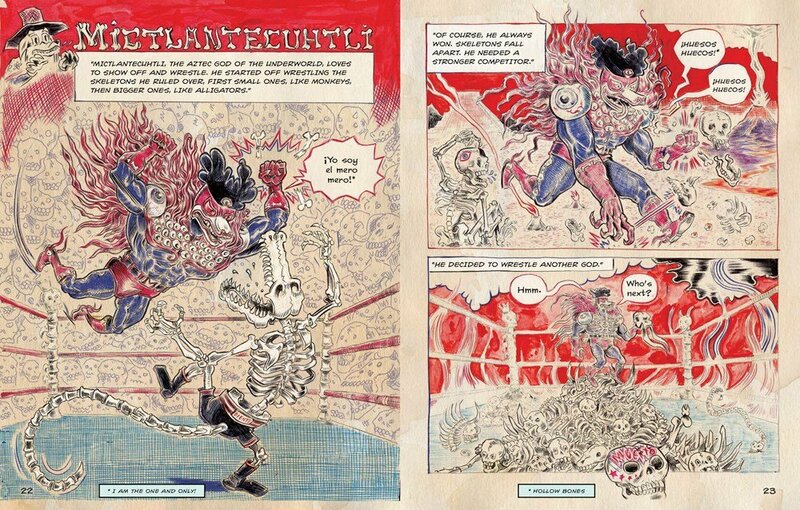 The gang have to face Mic's skeleton crew, the Wind of Knives, the challenge of transporting a bucket of water to the center of the earth and back and a wrestling match with lots of wrestling terms and a surprise from little Genie (spoiler!! their pet is really Tepeyollotl, the Aztec jaguar god who is Lord of the Animals) before they can reclaim their pet and return to the surface of the earth. There are so many more details in Lowriders to the Center of the Earth that I haven't even mentioned. I'll leave you with my favorite cameo appearance in the underworld comes when the gang pulls up to a torta shop where they see a familiar face. Perched behind the wheel of a monster truck with massive wheels, looking like a roadie for Mötley Crüe, his arm around a doe-eyed goat and a bottle of sangre de cabra in his hand is . . . the Chupacabra!